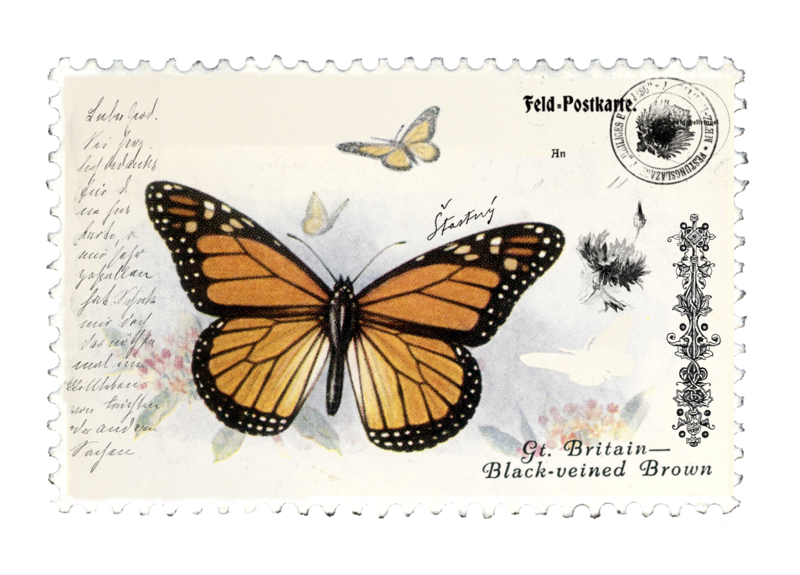 The Vintage Butterfly Postage Stamps will be available here each day. These are the FULL-SIZED elements. Click to bring up on your computer screen, then right-click and “Save as”. Make sure you have the big version, over 2MB each. The full-sized 5.5″ envelope is included in today’s card download. It coordinates with one of my kits from 2014. Gorgeous, as usual! Thank you again for these daily downloads. i think i told you about finding a monarch butterfly laying on the grass with dew on its wings, didn’t i? i got a perfect photo of it. i rarely go anywhere without a camera, and that was one time i was so glad i had my pocket 35 in my purse! i will enjoy using these stamps on a page with that photo! Yes, I told you I’d have a little surprise for you, didn’t I? I googled Monarch Butterfly and saw that I had a butterfly that matched those images, even though my Vintage Stamp doesn’t have that name on it. Gorgeous! Beautiful post cards, butterflies and envelope. Love this series. Thank you so much for sharing them.